Summer is wedding season, and the collections of the Manuscripts & Folklife Archives section of WKU’s Department of Library Special Collections provide evidence of the pomp and circumstance, excitement and humor with which Kentuckians have tied the knot through history. 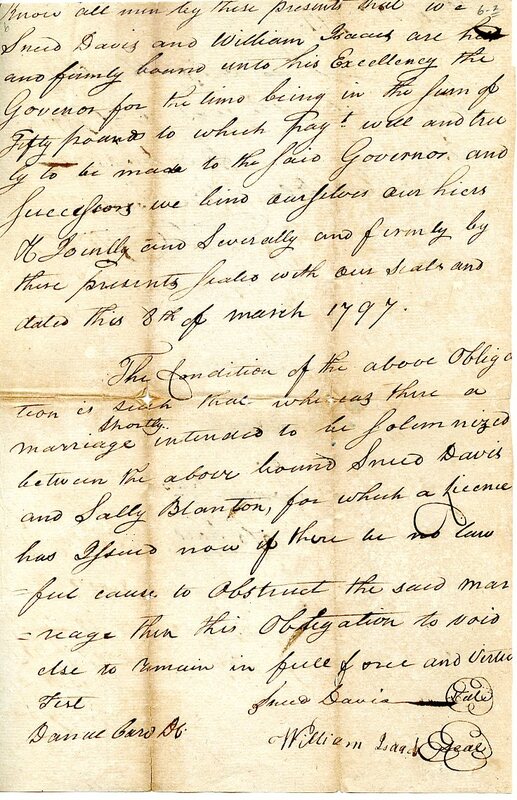 To begin with, our collection of more than 7,000 Warren County, Kentucky marriage bonds begins in 1797 and is a gold mine for those researching family history. In addition, many collections of family papers, such as the Margie Helm Collection, contain wedding invitations and announcements. Other collections document the unusual; for example, a double wedding that took place inside Mammoth Cave in 1879, inaugurating a custom that lasted until 1941. Photographs, such as Mildred Tucker‘s before her 1925 wedding, are indispensable to the occasion. In particular, many a local bride proudly posed in a creation made by the celebrated Bowling Green dressmaker Mrs. A. H. (Carrie) Taylor. And, of course, there are the diaries and letters of both participants and observers recalling the triumphs and tribulations of the big day. 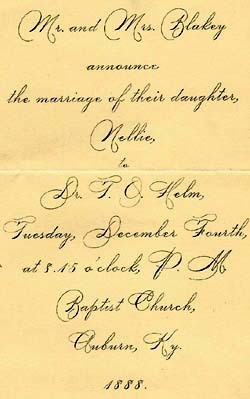 “This is Birdie’s wedding day,” wrote Russellville’s Fannie Morton Bryan on February 27, 1889. “Lena and Joe Gill and Mot Williams and myself stood up with them. That is as near married as I ever expect to be.” (She was right). Amid a whirlwind of preparations for her February 16, 1926 wedding, Bowling Green’s Mildred Potter and her mother addressed the “burning question” of attire for the men in the party. “Agonizing” over cutaways or tuxedos, they settled on “gray trousers and cutaways, with spats,” but a stressed-out Mildred “shed a few tears” when a telegram arrived from her fiance in New York that betrayed his misunderstanding of her diktat. Search TopSCHOLAR and KenCat for more of our collections that feature weddings.